If you are a home builder, I hope you realize that from a salesperson's perspective, selling new homes is a solo high-wire act performed without a net. If you have sold new homes before yourself, you know what I mean. You’re there in your sales center; often there alone. And then, customers appear. Suddenly, it’s SHOWTIME. You spring into action. Do your thing. Burn tons of energy. Hoping for a good outcome. Without a contract, nobody in the company will ever know what you did – how hard you worked – how close you came. Truth is, even with a contract, nobody in the company will ever know what you did – how hard you worked – how you made magic. From the outside, it’s a Black Box process. Impenetrable. Mysterious. Behind every new home salesperson there is a home building company. There are real people there, depending on their salesperson(s) to be successful doing something no one else understands, wants to do or knows how to do. But, they’re willing to provide support. Huge investments have been made to encourage sales success. A model home. Maybe, a sales center. A web site. Perhaps some advertising. Collateral materials. Displays. Signage. Prospects. All are assets provided to salespersons free of charge to help them succeed. When times are easy, it can be different. After all, salespersons arrive late. Stay indoors where it's always comfortable. Wear nice clothes. Drive nice cars. Get special treatment. Make too much money. Sales success just adds to production's burden. “Not another contract!" Maybe those of us who market and sell new homes are like kickers in the NFL. Everybody knows all teams need kickers. They praise them when they perform. But players tend to act like they don’t respect kickers very much. Why? Because kickers are different. Indespensible, but wierd. Head cases. So it often is in home building companies. If such a disconnect exists in your company. It cannot be allowed to continue. It is the responsibility of the first person who realizes this is going on to root it out and dispense with it. Hopefully, that person is you, the Owner or the CEO. If it is you, then it’s your responsibility to help your company get it together. All of you are in the same company boat. Your company's success in the marketplace depends upon everyone working together as a team. The typical divide in a home building company involves salespersons vs. production personnel. It's not that they naturally dislike one another. (OK, so maybe it is.) It's that they have different challenges, different styles and different objectives. Salespersons are devoted to creating relationships with customers, who are wildly individualistic. Salespersons have to mold themselves to their customers, get inside their heads, figure out what they'll buy so they can make the sale. Keep in mind, salespersons have to do this successfully to eat. There is no steady paycheck for them. Even though making sales is exhiliarating, the pressure they're under tends to make salespersons impatient with production folks whose lives seem risk free by comparison. without having flighty salespersons making things even more difficult. "Why can't our sales people just sell what we want to build when we want to build it?" There is a famous home building company here in Florida that is known for having perfected even-flow building. Their system was perfect; so perfect they couldn't bear to interrupt it, even when, in the recent crash, no new sales had been made for 6 months. You can go to one of their developments today, see a couple hundred adorable retirement homes with manicured lawns and nice people living in them. Then, you come to the first finished home that's empty. Then more of them. Then, the first empty home that's not quite finished. Proceeding on, each unfinished home is one day further from completion until at the end of the line, the last one is just staked out - there's no concrete yet. Beyond that, there are paved streets with utilities in place, empty lots and weeds. Every home builder should see this sight and marvel at it. Surely, it is proof positive that . . .
All builders know that's true. Still, it is human nature to spend more time and devote more attention to aspects of one's business which are closer to your heart than others. 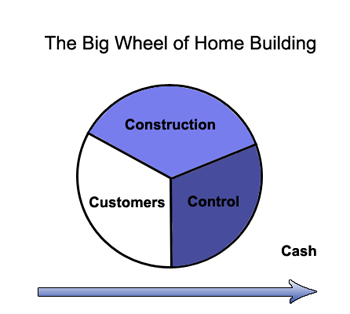 That's one reason why I find The Big Wheel of Home Building to be such a useful diagram. Let's take a look at it, shall we? First for many home builders is the joy of construction. “I love the smell of framing in the morning. It smells like VICTORY!” It’s also tangible, hands-on and highly artistic. Something good is created from the risk-taking and all the hard work – something to take justifiable pride in. It’s solid, strong, beautiful and filled with meaning. “Families live and grow in my homes.” It’s all good. Next, comes the need to count things and become accountable. The focus moves from art toward becoming a successful business. Management of people, and processes is the thing. Becoming more cost efficient is the overriding goal. "Home building would be a great business if it just wasn’t for those d… customers.” No builder actually says this, but many might like to. Yet, without connecting with customers, construction and control yield nothing but financial loss. Connecting may be the biggest challenge of all, because it is so different. Done right, homebuilding offers a great shot at creating genuine wealth for the company’s stakeholders. Put a little cash in. Draw a lot of cash out. While cost control is required, revenue enhancement is the real path to abundance. Getting the cash you want is dependent upon connecting with customers. Home building is a fabulous business with huge potential to create genuine wealth. If you'd like to enjoy all the satisfaction of building good homes for good people and make a boatload of money at the same time, you have come to the right place. It would be my great pleasure to help you as I have helped so many others.